At RHRLI, we watch with interest when it appears famous people have hair restoration procedures. We’ve certainly seen a few in the world of sports and we’ve also seen more than a few sports figures who might benefit from our permanent solution, the ARTAS® System, which uses robotic technology to give you healthy new hair. 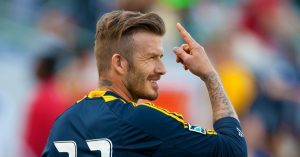 After viewing the Instagram photo, Manchester-based hair loss expert, Dr. Asim Shahmalak, told the Daily Mail, “David Beckham’s hair does appear to be thicker than in the pictures of him in Miami a couple of weeks ago,” Shahmalak said that Beckham had been showing signs of male pattern hair loss. He also said he believed that Beckham might also be using hair products to give the impression of thicker hair. This is something Beckham’s longtime teammate on the English national team, Wayne Rooney also did, according to Dr. Shahmalak. Rooney announced the hair transplant via Twitter in 2011. It’s believed that he received a Follicular Unit Extraction (FUE) procedure, similar to the method we use with ARTAS® at RHRLI. Rooney looks great, and you can see his talent and new hair close up in the U.S. now that he’s a member of DC United in Major League Soccer. Two other major sports stars, who are rumored to have undergone hair transplant procedures are Formula One racing superstar Lewis Hamilton, and tennis legend Rafael Nadal. There are also more than a few great athletes who might want to consider contacting RHRLI the next time they’re in the New York area. The pop culture website Complex put together a list of athletes who they think can benefit from a hair transplant procedure. Among them, are the world’s most famous golfer, Tiger Woods and Los Angeles Angels slugger Albert Pujols. Another sports superstar who also recently relocated to Hollywood, LeBron James, was also on the list. You don’t have to be a sports superstar to have a million-dollar look. If you’re ready to change your life with RHRLI and ARTAS®. Our robotic technology is minimally-invasive. Unlike other procedures like Follicular Unit Transplantation (FUT), also known as strip surgery, we won’t use a scalpel, and you’ll be back to your normal life in just a couple of days. To get started contact us today.